The road predated its naming by at least 25 years. On a scrappy remnant of a survey plan dating from the late 1840s to early 1850s (SO 833) the end of the line of the road, where it juts off from what we know today as Carrington Road, can be seen. It swung past Allotment 60, described as “Excellent volcanic soil on scoria”, 84½ acres of prime farmland on the Mt Albert West aquifer leading towards the springs which come up even today on the farm which used to be where the lunatic asylum patients were (hopefully) made well, just to the north. But the first major landowners there on Woodward Road to begin with were not named Woodward. Perhaps the paper road had no documented name, only local ones now lost to time, in those first years after the government survey. Anyway ... the first owner of Allotment 60 was a woman who didn’t live there. Margaret Adam came to New Zealand in 1841 on the barque Brilliant, her and her husband James one of those couples convinced by the New Zealand Manukau and Waitemata Company that a wonderful city of Cornwallis was ready and waiting for energetic young immigrants from Scotland, like themselves. The project is now infamous for its lack of forethought, and many of the settlers traded in their largely worthless “titles” for land elsewhere on the Auckland isthmus. But before that could happen for James and Margaret, James was drowned in an accident, which also claimed the life of Captain William Cornwallis Symonds and a Mr McAlpine. Widowed, Margaret was still offered two pieces of land at Mt Albert by Governor FitzRoy in September 1845: Allotment 60, and Allotment 54, the western slopes below the extinct volcano in the area also named Mt Albert. In her will after her death (the will was registered at the Land Office in October 1853 -- deeds indexes), she requested that her brother-in-law, John Shedden Adam (his story is related in my post on Banwell in Avondale), administer the two properties for the estate. J S Adam was, by this time, a draughtsman and architect living in Australia, never to return, so there’s no real telling who lived there on the farm fronting the side road from the 1840s right through to the early 1870s. Mt Albert Road Board records (available at Auckland Council Archives, series MAC 104), starting from 1867, show J S Adam as both owner and occupier until Mark Woodward purchased the site in 1874 (NA 8/177) . The belief by some descendants that Mark Woodward obtained the property from John Logan Campbell (as published by the Mt Albert Historical Society in their newsletter dated Oct/Nov 2008) cannot be proved by documentation, but may be possible. In June 1873, auctioneers Samuel Cochrane & Co were instructed to sell the two Adam Estate farms, Lot 54 and Lot 60. (Auckland Star 5 June 1873) These sold on 9 June, Lot 60 to Mark Woodward for approx £718 (84.5 acres, at £8 10s per acre). Lot 54 went to Henry Lees – but his title (NA 8/86) shows the previous owner as John Logan Campbell: from June 1874, a year after the auction. It sounds like the auction came first, perhaps after Campbell had offered J S Adam’s agents in New Zealand a price for both farms – then arrangements were made for a retroactive title later. 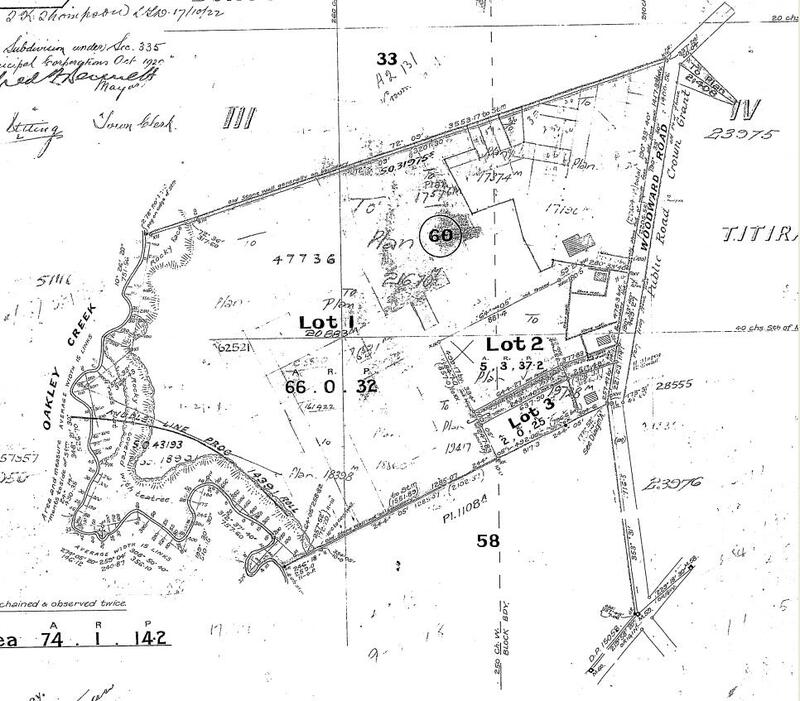 Campbell did, however, brief hold title to Margaret Adam’s other major Mt Albert property at Allotment 54 – for a month, also in 1874 (NA 8/86). But Mark Woodward was not the first of that family name to be in the area. In March 1860 the Lord Burleigh arrived, with James and Sarah A Woodward on open steerage. (Southern Cross 10 February). By October 1864, James Woodward had a paddock at Mt Albert. (Southern Cross 11 October). In December that year, Lewis Sayers broke into the Woodward residence at Mt Albert and stole : “three white petticoats, three night-dresses, one chemise, three shirts, two tweed coats, one serge coat and vest, one pair cord trousers, and one mat.” (Southern Cross 3 December) The Mt Albert rates books start only at 1868 for Woodwards in the area, and show someone by that name living in a house on part of Allotment 55, Parish of Titirangi. This is slightly odd, as Allotment 55 was the legal description for the mountain and quarries leased out by the Provincial Government from 1862 (SO 927 & 1148, LINZ records). This was divided into smaller allotments at the time of the leases though, one of which was Allotment 99, leased to William Bray in 1862, and definitely linked to Mark Woodward from 1871. Even so, Mark Woodward seems to have been quiet with what he did. January 1870 is when we see the first reference found to Mark Woodward at Mt Albert, when he reports finding a lost steer in his paddock. (Southern Cross, 27 January) So, if Mark Woodward had his paddocks on the northern side of Mt Albert, where was James located? At this point, it is anyone’s guess. Could it have been that he was leasing use of the farm at Woodward Road? October 1865 – James Woodward apparently had been given nominal ownership for a 40 acre grant at Waitakerei East, worth £3 in rates. He argued in court against the rates demand, saying he had no title to the land; he had never been on it; he had never even seen it.” The case against him was dismissed. (Southern Cross 30 October) In January 1866 – he appears as a groom for the mare Sally Brass at “Edgcumbe’s farm, Mount Albert”. (Southern Cross 20 January) June 1866 – James Woodward is accused of assaulting George Bray. (Southern Cross 19 June 1866) See also The Lively Brays of Mt Albert. By 1868, at least, I suspect that James and Sarah Ann Woodward lived somewhere close to William Edgcumbe’s Great Northern Hotel, at Western Springs. In July 1868, a scuffle between James and Sarah Woodward, and an old woman named Mary Cameron at Edgecumbe’s Great Northern Hotel ended up in the courts. The case was dropped, but the judge warned all parties against such behaviour in future. (Southern Cross 3 August) In October 1871, he was appointed ranger for the Mt Albert district. (Southern Cross, 4 October) He appears to now be living “in the neighbourhood of Edgcumbe’s Hotel”, described as “at the Whau”. (Auckland Star 31 October 1870; 17 May 1871) He doesn’t appear, however, on a list of Whau ratepayers for 1875. Mr J. Woodward, of the Whau, was driving a spring cart this afternoon, and as he backed towards Arthur's auction mart he came violently against the large cast-iron verandah post, smashing it in several pieces. It fortunately fell on the pathway or it may have done serious injury to a lady who was in the van at the time; she narrowly escaped. The post may cost several pounds to replace, but it is all for the good of trade, and the distribution of cash, although Mr Woodward has to pay the piper. Wherever he lived, he and his wife had some extra money for investments, such as Sarah’s 250 shares in the Karaka Goldmining Company. (Southern Cross 24 August 1869) and his own 15 shares in the Coromandel Excelsior Goldmining Company. (Southern Cross 12 January 1872) In April 1883, James Woodward was appointed to the Newton Licensing Committee (including Pt Chevalier, Western Springs and Grey Lynn), along with Thomas Faulder, Robert Garrett, James Crawford and Charles Frederick Partington. (Auckland Star 12 April 1883) But soon after this, things turned sour. Around 1880, James Woodward was apparently kicked in the head by a horse, along with suffering a bad cold and coming down with "rheumatics". He was never quite right after that, accused by his wife’s lodger George Elton later of “eating, sleeping, drinking, and riding his horse about the country,” “hardly ever sober”. (This would have made him an intriguing choice to be sitting on a Licensing Committee at the same time, I would have thought). On 12 August 1884, Sarah Ann Woodward obtained a protection order against her husband, and in July-August 1885, Woodward was admitted then discharged from the Auckland Lunatic Asylum, (Index cards, Archives NZ) and then was admitted to the Old Men’s Refuge. The judge refused to lift the protection order, but cryptically stated “…that had the same evidence been adduced when the application for the order was made, it might not have been granted.” (Auckland Star 19 December) The situation between James and Sarah Ann meant that he was destitute, while she was the one with money and assets, something unusual for those times. The weekly meeting of the Executive of the Hospitals and Charitable Aid Board was opened at 4 o'clock yesterday afternoon, in the office, Victoria Arcade … A letter was received from the Relieving Officer applying for the necessary legal aid to compel Mrs Jane Woodward (Mount Albert), Mr Robert Houlden (Gisborne), and the brothers Brindle (Howick), to contribute to the maintenance of their destitute relatives, viz., a husband in Mrs Woodward's case and mothers in the other two instances. 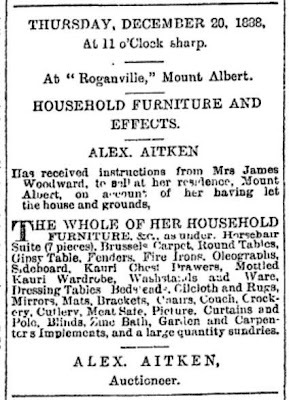 In November 1894 – Sarah Ann Woodward advertised the sale of her property fronting St Marys Lane and Counsel Terrace (today 15 St Marys Lane and 11 Counsel Terrace – Auckland Star 9 November 1894) This had been purchased by her in March 1887 (DI 19A.355). 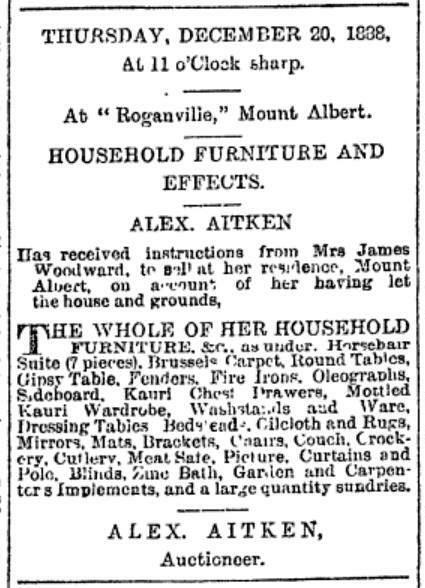 By December 1888, she was letting the house and grounds out to other, and selling her effects. (Auckland Star, 13 December). It would appear, though, that her mortgagor Monaghan took over the property in December 1894. It is possible that the James Woodward who died 30 January 1892, aged just 58, and who was buried two days later at the Anglican section of Waikumete Cemetery, could be the same man. If so, with poverty, abandoned by his wife in whom he entrusted so much, and with the effects of his head injury, the end was probably a blessing. In March, Mark Woodward with his wife (also named Sarah) arrived on board the Liverpool. Like James Woodward, Mark Woodward is associated with a 40 acre land grant in West Auckland, somewhere behind Anawhata. “As their savings had been expended on the trip out, Mark Woodward and his sons went to work for the Gribble family at Cabbage Tree Swamp (Sandringham) milking cows, until they were able to buy their own cows and lease Mt Albert (the mountain).” (Auckland War Memorial Museum Library catalogue info online) Mark Woodward’s name doesn’t come up on the deeds index for Allotment 99 however; (DI 11A.18) – he may have sub-leased it from William Bray and a Mr Webster. After purchasing his farm at Mt Albert in 1874, he got a £30 per annum contract to deliver mail between Auckland and Henderson’s Mill. (Southern Cross 24 April 1875). Then in May 1878, now a dairy farmer, he led two of his neighbours in a campaign against the Gittos tannery for polluting the Oakley Creek. (Auckland Star 11 May 1878) Accusations flew, including that a bottle of water taken to the Mt Albert Road Board as proof smelled, according to Mr McElwain, of “cow dung”, indicating pollution possibly upstream of the tannery, just as much as from the chemicals poured into the stream below. However, independent tests made upstream disproved this. (Auckland Star, 17 May 1878) At the same time, however, accusations were made that Mark Woodward was depositing night soil on his farm. (Auckland Star 13 May) Woodward finally took the Gittos family to court for an injunction in 1883. (Auckland Star 17 September) For more, see The Leather Makers. Mark Woodward was charged at the Police Court to-day with attempting to drive a horse and trap over a railway crossing at Mount Albert when the engine was approaching and within a quarter of a mile. Mr Theo. Cooper appeared tor the prosecution, and Mr Button for the defence. It appeared that the defendant's cart collided with the railway train, and his horse narrowly escaped serious injury. The defence was that the act was not done knowingly or wilfully. Evidence was given by the guard and engine-driver that the whistle was blown shortly before the crossing was reached, and by four other witnesses, who stated that it was impossible to see the train approaching until it was right on the crossing. His Worship found the offence proved. The defendant had shown a certain amount of negligence, and the small fine of £1 and costs, £5 4s, was inflicted. Beazley & Punch are also known for being the directors of Ambassador Picture Theatre Ltd, the builders of Pt Chevalier’s Ambassador Theatre (1929), and a block of shops from 895-899 New North Road, Mt Albert, also in the 1920s. Woodward Road – not really part of the estate, but the main road frontage. I don’t think there is much doubt that the road had come, by the time of Mark Woodward’s death, to be identified with him. Mark Road – Appears on DP 17190, part of the Beazley-Punch subdivision, November 1923. A large building which appears on an earlier plan (DP 16277), identified by Sir Harold Marshal, a descendant, as a large barn, seems to have been obliterated by the line of Mark Road. Rhodes Avenue (DP 17576, 1923) – as the mayor of Mt Albert Borough at the time was Leonard E Rhodes, who signed approval of this part of the subdivision on behalf of the council, I think it’s a good guess that this was an “impress the Mayor” thing by Beazley & Punch. There’s a similar development in Avondale, where William John Tait was so immortalised, also while both alive, and a serving mayor in office. Raetihi Crescent (DP 17576, 1923) – As John Punch lived in Raetihi, I think that goes towards explaining that street name. Phyllis Street (DP 17631, 1924) – could be named after a relative of either Beazley or Punch. One thing about the Phyllis Street Reserve was that it was the Mt Albert Quarry, then the local municipal rubbish tip, before being reclaimed as the park it now is. All this, on the land formerly owned by the man who disliked pollution from a tannery and night soil depositing. Laurel Street (DP 20883, 1927) – again, could be named for a member of either the Beazley or Punch families. Or, just a tree name. Renton Road (DP 21670, 1927) – a place name, perhaps? Hopefully, more information may come to hand in the future. That was really interesting about the two Woodwards. Quite some story each had to tell. Mark Woodward seemed to be every active with taking a lot of people to court. Can't get over the way he was being done for the horse and cart business at the railway crossing. Lucky he did get out alive from that one. Not a good idea to ignore a train about to approach. I always wondered about the name so now I know.